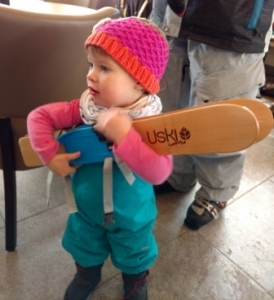 Baby Snow Retreat was lucky enough to be given some toddler ski’s from our friends at Ski Higher earlier in the season. She had started putting them on and playing with them inside our apartment, so we thought we should give her the opportunity to see what they were really designed for. To make sure she had the right start we hooked up with our friend Jon from Sweet Snow sports to give her her first sliding experience. 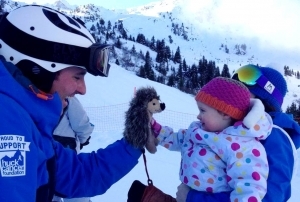 Jon has oodles of experience teaching both chalet guests and trainee instructors but, more importantly, he has a hedgehog puppet called Harry. 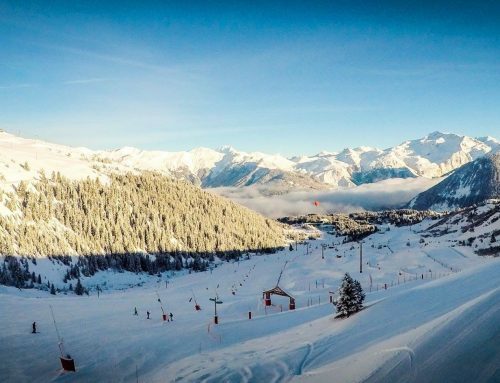 So with Harry convenietly stashed in Jon’s jacket we headed off to the magic carpet at the top of the La Tania gondola, an ideal place for little ones to have their first slide whether its on a sledge or skis. To make life a little easier, Jon attached a Wedgease to the front of the skis to keep the tips close, but stop them crossing over. Then it was time to hop on the magic carpet (much like a travelator in an aiport) and then weeeeeeeeeeeeeeeeeeeeeeeeeeeeeee……………….. 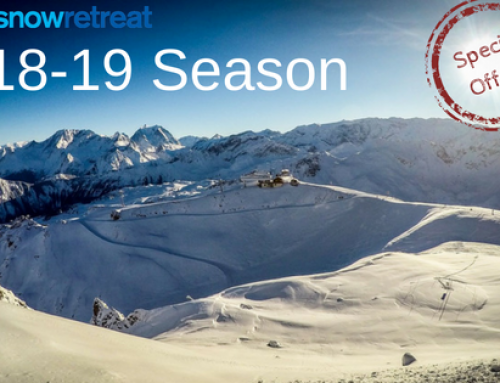 Although not elated, baby Snow Retreat seemed somewhat amused, and Harry was only needed in a cameo appearance rather than assuaging the tears brought on by fear or non-comprehension of the situation (babysnowretreat watches people skiing by her creche daily). After a few runs, baby Snow Retreat (or was that mummy?) 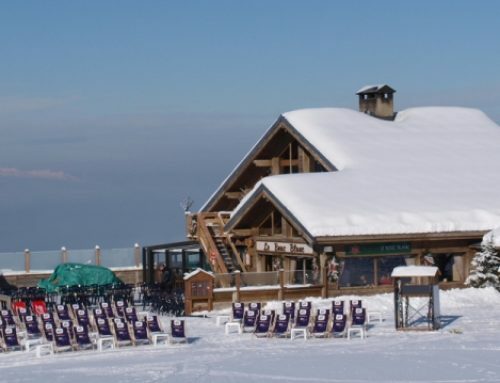 was ready for a hot chocolate at the Bouc Blanc restaurant. 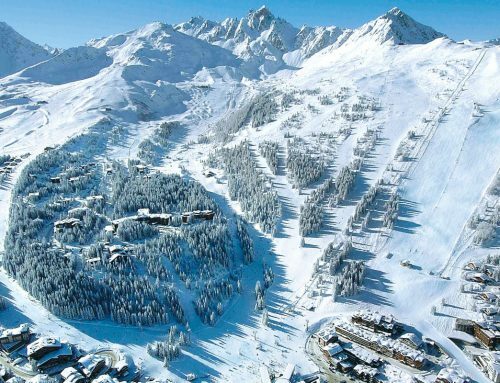 So watch out, in a couple of years baby Snow Retreat will be chasing you all down the mountain! Disclaimer: No toddler was hurt in the making of this blog. 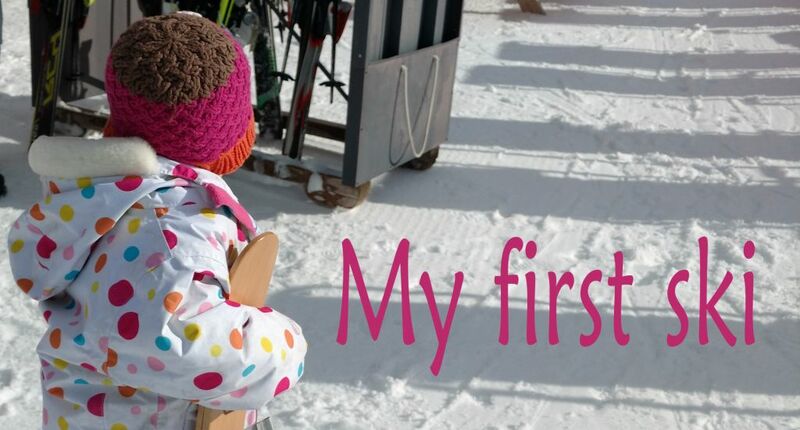 Ski schools generally advise that children start ski lessons until they are 4 years old. Harry the Hedgehog is RADA trained and a full card carrying member of Equity. Uski have not recommended to us that the skis pictured should be used for skiing in any way and we presume they are infact intended as novelty salad tossers. The hot chocolates used were not actually consumed until they were cooled a bit by blowing on them.